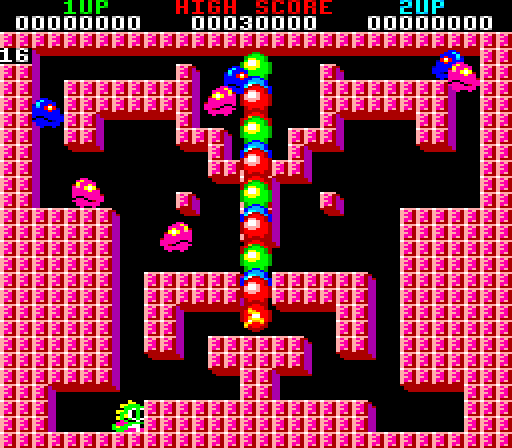 Bubble Bobble is one of those games that are very difficult to dislike. It's relentlessly charming and pathologically upbeat, with lead characters that are so instantly loveable if you dropped pictures of them on a desert island whose inhabitants had no contact with society you would be guaranteed a dragon-centric Cargo Cult within seven days. 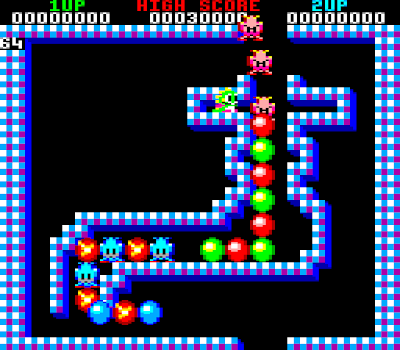 The original port of the game to the Amstrad CPC, however, was inarguably one of the poor relations of the franchise. 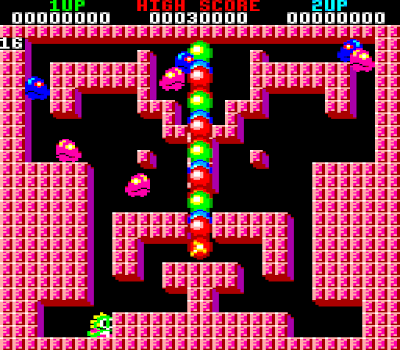 It lacked the spirit that made the arcade version so great, and it is an unadulterated pleasure to play a new, shiny port of the game that shows what could have been done with more time and effort. 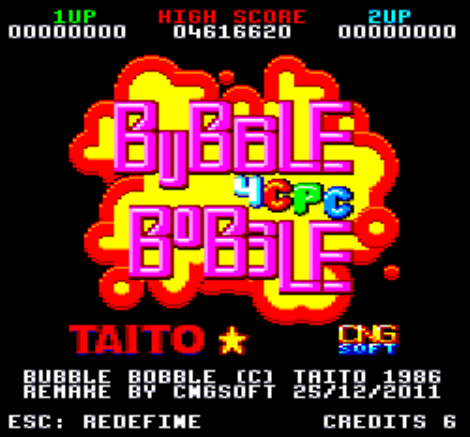 Bubble Bobble for the CPC, abbreviated concisely by the developer into BB4CPC, underlines the excellence that can be achieved by one person working alone on a labour of love, for absolutely ages, without the pressures of working in a commercial development environment with deadlines, managers and budget restraints. The bangs and whistles, the panache and the cuteness, the occasional fiendish difficulty and the pathologically infectious theme tune are all there in spades. Normally when I review a game I give it a quick blast, then turn it off to make some notes before continuing to play it until I get a bit sick of it. When I fired up BB4CPC I played until Game Over five times in a row before I even opened my word processor. The gameplay is just as absorbing as some of the best ports of Bubble Bobble, and is even close to the quality of the original arcade game. 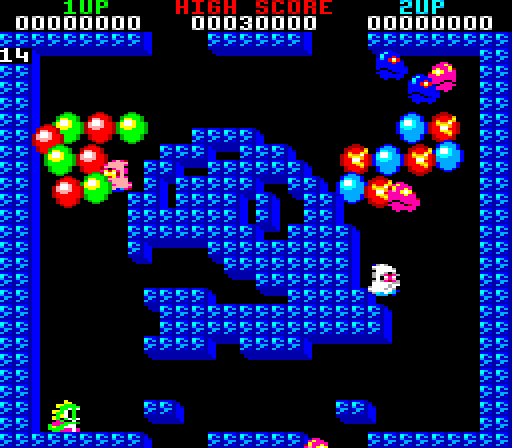 The graphics show the game up as a labour of love; the amount of effort put into giving the game the classic Bubble Bobble look shines out from the screen at all opportunities, and (I say this with only a limited knowledge of the CPC's inner workings) I get the feeling that the graphical capabilities of the computer have been pushed pretty hard to get this game looking the way it does. BB4CPC performs well in the audio stakes too, the requisite sound effects and music are all there, and I actually got a rush of excitement the first time I heard the sound the dragon's breath attack made! Maybe that's an overreaction on my part, but I honestly would have a hard time arguing against this game's soundtrack being of a high quality. It's nice to see that the release is still being tweaked, with an early problem with the water bubbles causing the game to crash being fixed quickly, and other than a bug issue that I've personally never experienced finding things wrong with this game is a tough job. BB4CPC has been put together with a deft hand and an eye for detail, and most importantly an apparent love for the original material. At this moment in time the only negative I can dig out of my BB4CPC experience is that the theme tune is probably going to be stuck in my head for at least the next week. Download the the game here (from the BB4CPC site). 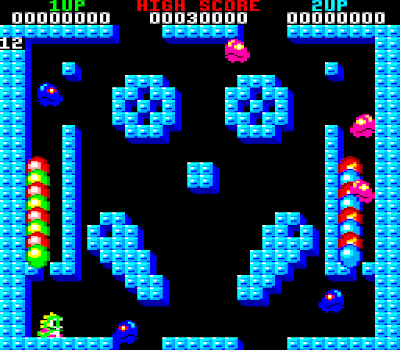 Run it using WinAPE (freeware).